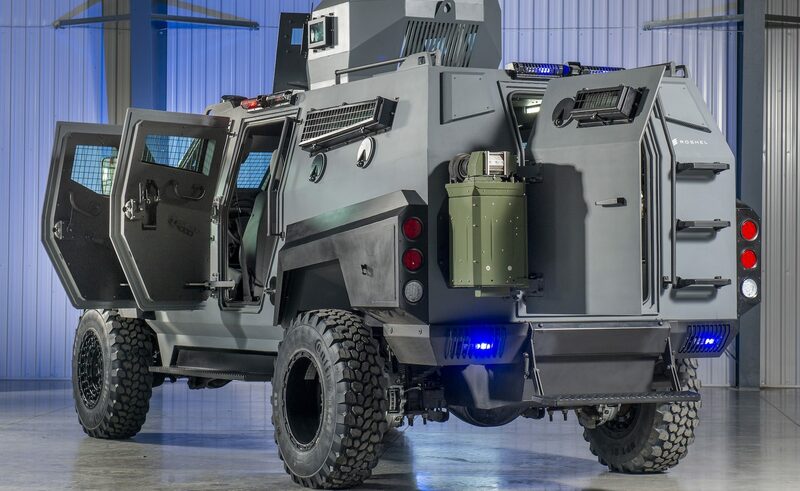 The Senator is the newest armored truck to come out of North America. 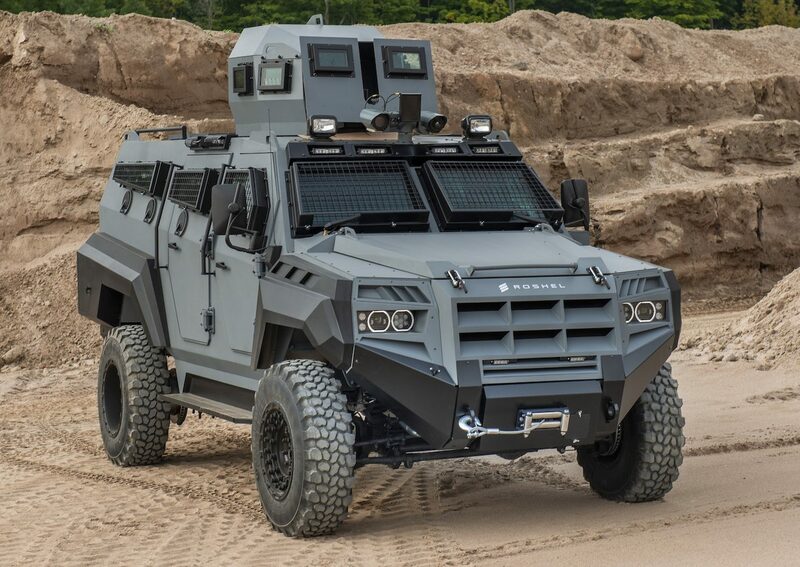 Its manufacturer, Roshel Defence Solutions, is a supplier for Canada’s law enforcement agencies and military but its venture into wheeled armored personnel carriers sets it on the path to global success. Roshel is promoting the Senator as a rapid intervention vehicle for elite police units who need an alternative to a bulletproof van. The Senator is also available for military use but its present variant is equipped for high intensity urban environments. Built over a commercial chassis (a Ford F550 pickup) with independent suspension, the Senator can be armored to STANAG III–impervious to machine gun fire–and is optimized for deadly shootouts. Protective mesh wire cover the two-panel windshield and the rest of the Senator’s laminated bulletproof glass windows that can stop .50 caliber rounds. Surveillance cameras on a pivoting stand allow the crew to observe their surroundings without exposing themselves. If any tense situation gets out of hand there are a half dozen circular firing ports for the vehicle’s occupants to discharge their weapons. As a further precaution, Roshel claim the floor of the Senator is strong enough to resist hand grenades and other small explosives. Up to 12 passengers, including the driver, can fit inside the Senator although the basic variant seats just eight. 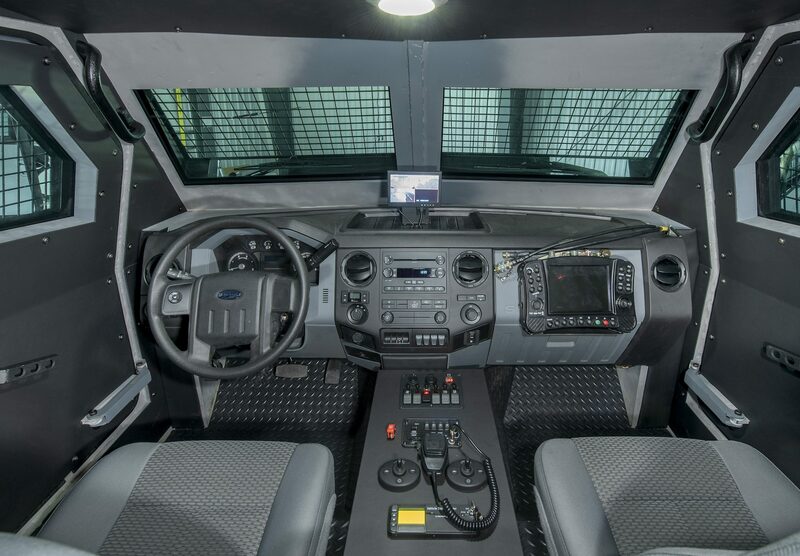 There are at least six blast-resistant folding seats behind the cab although the number can be increased. A large circular roof hatch serves as a mount for a turret that may or may not have a protective cocoon. There are two additional square roof hatches for the passengers to either keep watch or leave the vehicle. Aside from a single rear swing door, exiting the Senator can be done by climbing out the roof and using the handlebars at the back. Roshel offers alternating two or four-door configurations and even a hydraulic ramp for the passenger compartment should the customer request these. Inside the Senator. Via Roshel Defence Solutions. Each Senator runs on a 330 horsepower 6.7L Diesel V8 engine giving it a top speed of 120 kilometers per hour. Driving the Senator over any terrain isn’t difficult thanks to its high ground clearance, six-speed automatic transmission, and runflat tires. To entice local precincts, and maybe the armed forces as well, Roshel can add a robust air filtration system for CBRN emergencies; detectors that trace explosive and toxic gas; lighting fixtures for night time missions; and integrated ladders and ramps for assaults on buildings. The Senator is the “middleweight” among Roshel’s armored truck catalog. Its smaller sibling is the Partisan while a dedicated mine-resistant truck called the Admiral is tailored for counter-insurgencies and urban warfare. Since it was unveiled in the middle of 2018, orders have yet to be announced.